So that my Husband and others who are not here can see what is going on, I’ll be updating as the storm progresses. Newest posts will be at the top of the page. 4:35pm US EST. This is probably the last update for this post. We’ll get a plow in the next 12-24 hours, with a lane out of the neighborhood, but not plowed curb to curb. There really isn’t anywhere right now that they can put all the snow. I spent 2 hours doing a bit more digging on the sides of the driveway, the sidewalks, and clearing a path to the mailbox and other neighbors. And I spent a lot of time shoveling other folks’ driveways/sidewalks and talking. Lots of shared shovels and tending to kids and dogs. The small amount of cat litter on the driveway allows me to move the car back and forward without sliding into a snowdrift. Progress. Tomorrow will likely require more shoveling once the plow comes through. I’m averaging 2.5 hours a day shoveling at this point. After a snack, some Advil and a shower, I am feeling pretty tired, but clean and warm. Last pics for this post below. Note all that clearing is by hand – no snow blowers here. 10am US EST Sunday – Hot sun, no breeze, at least not in the back yard. I was able to dig out the bottom of the gutter, the sump pump pipe, the basement window and the AC unit. 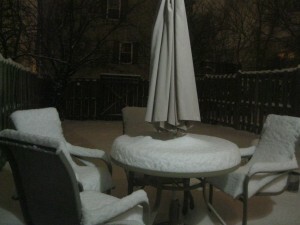 I took most of the snow off the table because I didn’t want it to snap under the weight of it. 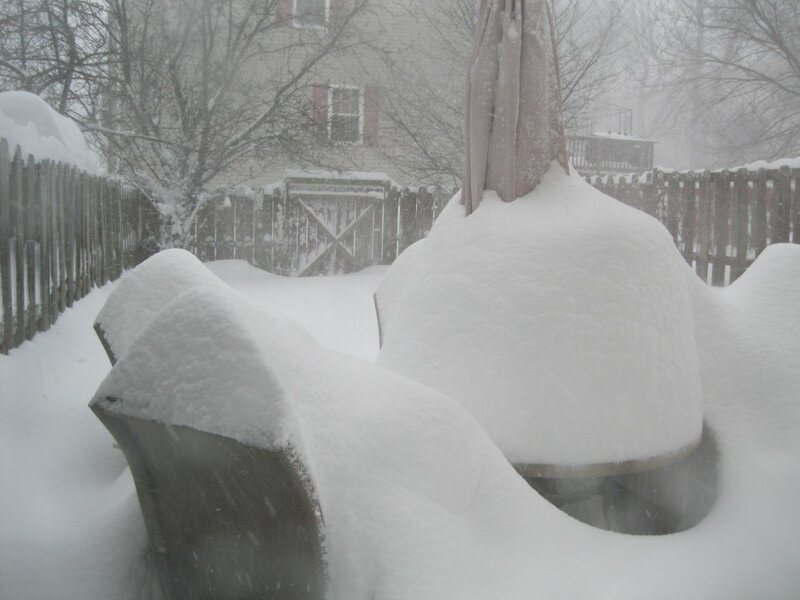 The snow was over 36″ on the table. It’s much higher in the backyard at ground level. I’m sure some of it is drift, but that doesn’t change that it’s a lot of snow. With direct sun in the back yard for the remainder of the afternoon, we’ll see some melting. It’s dripping off of the roof, with an occasional slip of snow off the edge and onto the ground. I’m not planning to do more shoveling back there. I just wanted it away from the house, the utility boxes, and the window so that it didn’t leak into the basement. I spent an hour and 20 minutes out there. I plan to head out front soon – just taking a break. Not cold at all though. I worked up quite a sweat while talking to neighbors that I’ve never spoken to before (folks behind our house). 7am US EST on Sunday, 24 Jan 2016: Hellooooo little Hobbits! I grabbed the camera as the sun came up to get some shots before people start wandering out to dig out. Most people have not done any shoveling. 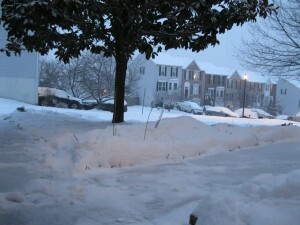 The hired HOA plow has not been seen yet either. I’m worried this might be too much for a pickup-truck-with-a-plow-on-front to manage. I don’t know if the HOA has hired someone with a Bobcat to come in as backup. Power stayed on. It’s warm. The sun is up and is melting snow off the roof. I know this because there’s an occasional thud of something falling to the yard. The front door is again snowed up to the lip of the storm door. It’s breezy and the snow drifted a bit last night. I suspect with the sun, we’re going to see some melting of the top layers of snow and refreezing tonight to form a crispy shell. Because of that, I want outside as soon as possible to get started reshoveling the driveway, etc. All that space behind my car? 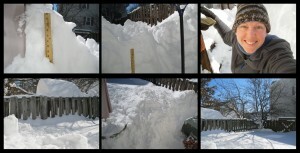 That was the 2 hours of shoveling completed last night. I’m still a bit stiff in the shoulders from that, but nothing a couple of Advil can’t handle after some breakfast. Also, that house with all the snow on top – it always looks like that after snow. I call it the frosting house. I love the way it looks. As you can see from the parking lot pictures, most of the cars are buried. Most of the cars in the driveways are buried as well, but I’m more worried about the ones in the street that have high potential of getting hit by an errant plow. It will take hours to get those cars unstuck. 7:57pm US EST: Well, flights are booked. 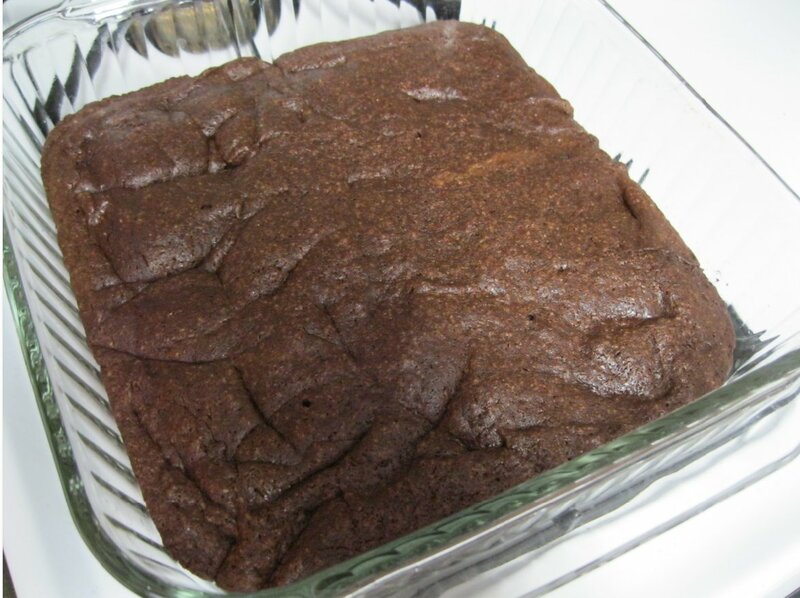 Dinner is made. Coffee is in-progress. 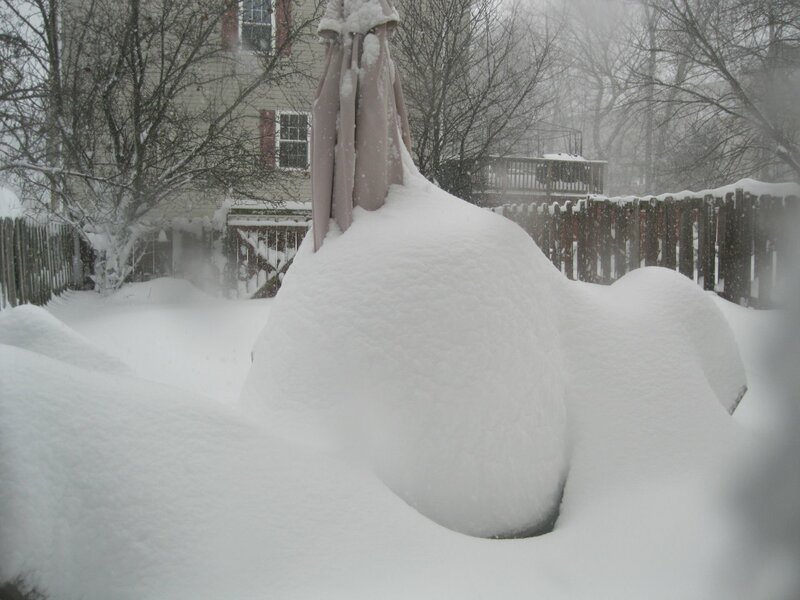 Shoulders are protesting loudly regarding the excessive snow shoveling. I expect to sleep very well tonight. And now, pics. 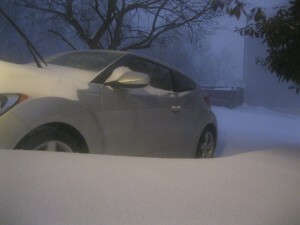 The car had 7″ of snow beneath it! There was no snow under the car when I parked it there. The car got stuck after I moved it to shovel the front half of the driveway closer to the garage. It’s back in place now. We are mostly out of room to throw snow in the front yards at this point. 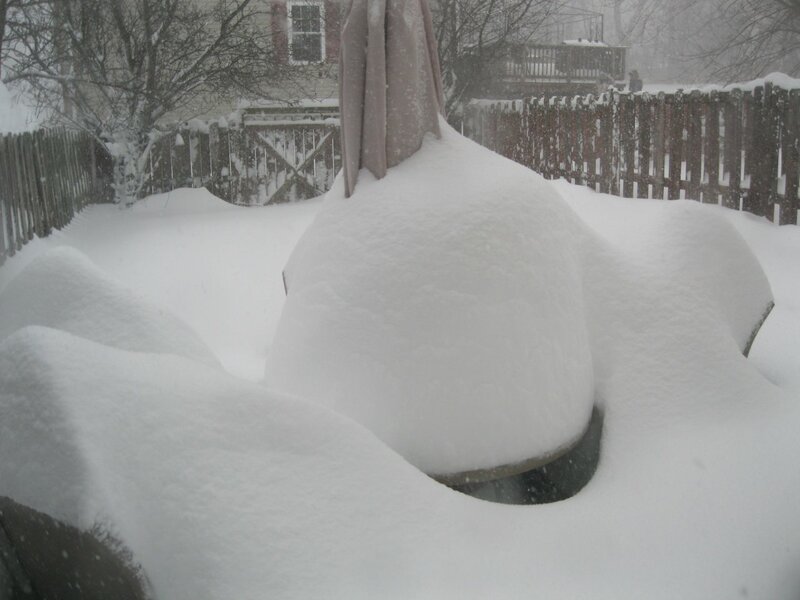 Snow shovel and yard stick for scale. 6:48pm US EST. 2 hours of shoveling. I made it to the street, then got my car stuck. Then dug it out and and got it back up the driveway (thank you, cat litter I bought last year for just this type of scenario). IN the meantime, United Airlines is failing miserably with flights back from New Orleans, cancelling Husband’s flight a second time. I’ve just had peanuts and saltines for a dinner. I’ll upload pics in a bit. We’re in the height of the blizzard at this point. 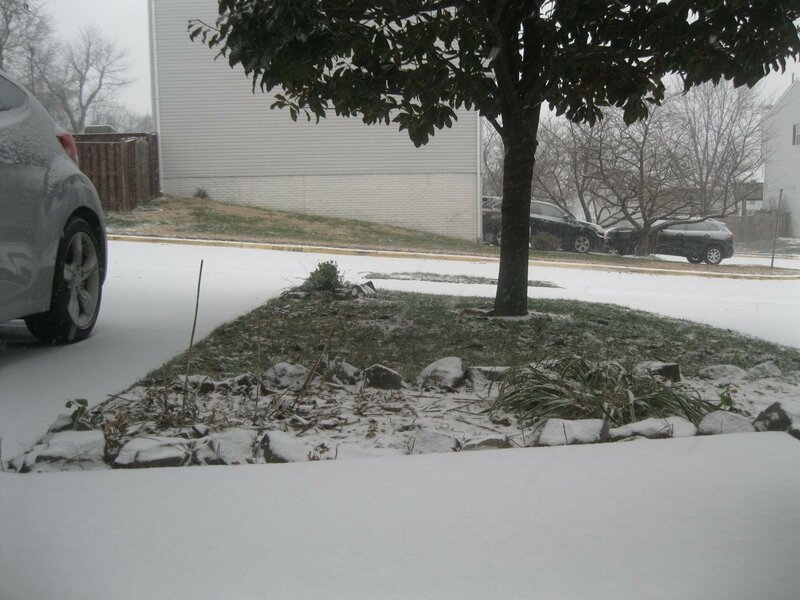 Where I am, in Loudoun County, we’re getting up to 2″ of snow an hour, and it supposed to stay this way for the next 4 hours. At nearby Dulles Airport, it’s 25 degrees and 25mph winds with 40 mph gusts. 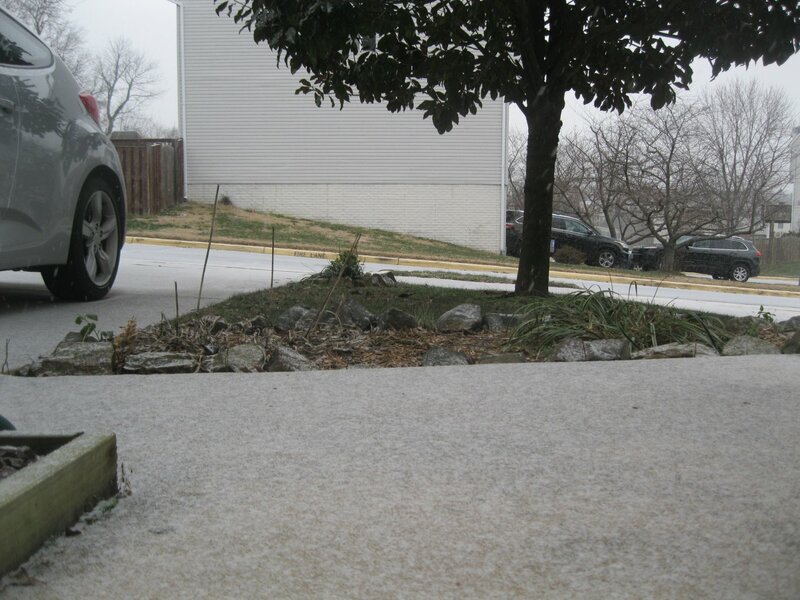 The front stoop is again covered with snow above the lip of the storm door. The neighborhood parking lot is full of buried cars. 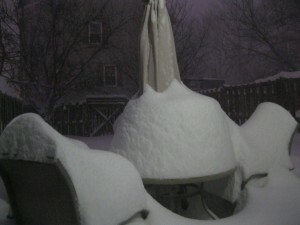 I can’t imagine digging that out tomorrow. 12:50pm US EST. 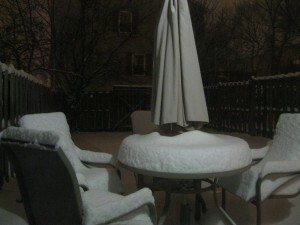 Still snowing. The table in the backyard has almost disappeared. 11:25am or so: Tried to shovel. Managed to just dig out the front door again and go back in. It’s blowing very hard and there’s not much more room to pile snow. You can’t throw it, so you have to redistribute other piles toward the tree/center of the yard, to have a place to put more snow. And that is difficult when it’s blowing right back at you. I’ll keep a watch on the door, but probably won’t do much until the storm is over. 10:57am US EST: I’m thinking of making brownies. I’ve resisted twice, but I might go ahead and do it, if I really have to shovel this entire mess. The backyard is getting disturbing. The below is a picture was shot through the remaining clear portion of my window between frost shards. Note, in some places, the snow is halfway up the fence. I haven’t seen this is several years. Wind chime is still blowing. Birds are looking for food. The kids are slowly coming outside, but it’s miserable in the wind. 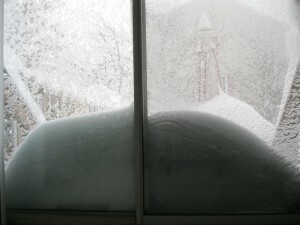 The snow is again to the top of the front door step, so I will likely need to go shovel again shortly. 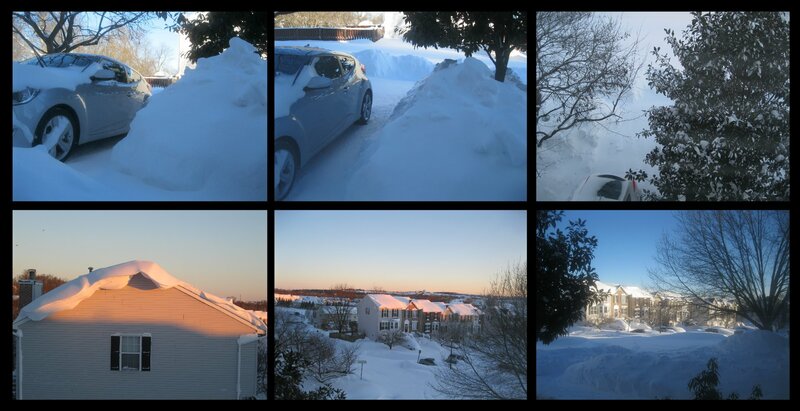 9:30am US EST Saturday Developments: Well, I hired a crew to come shovel and snow blow at 4pm. They just texted to cancel. “I’m sorry, we can’t make it to your house. The conditions are too extreme.” Did they expect otherwise? 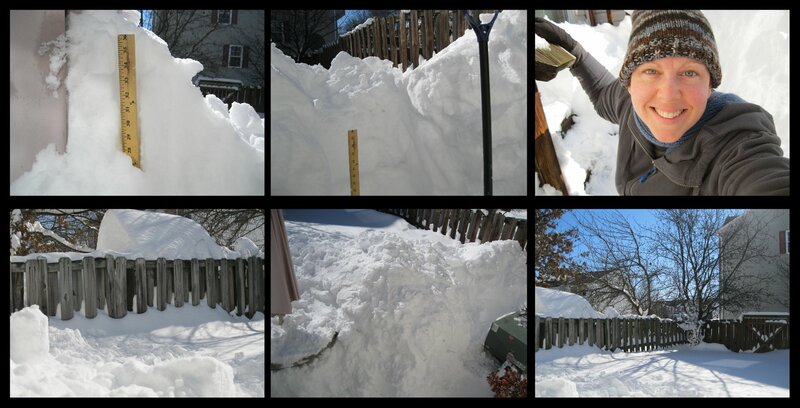 That was kind of the whole point – 30″ of snow was more than I wanted to shovel. Oh well. 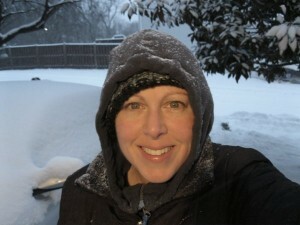 Luckily, before they cancelled, I did what my mother said not to do, and went outside and began shoveling. 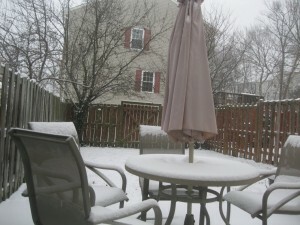 8:32am US EST Saturday: The snow is sticking to the slider window so it’s getting more difficult to get a clear shot. The wind is really blowing, and the snow is drifting so much that I’m not sure trying to shovel right now would make an impact. Some houses have no snow at all on the roof – it’s blowing off the roofs. Others have a good foot of snow on top. The way the houses were built here, some rows are less protected from the winds than others. I don’t know what our roof looks like and I might not get a view until later today. 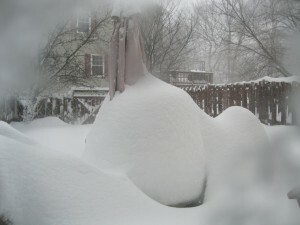 Here’s the backyard as of 8:30am. 6:45am US EST, Sat 23 Jan 2016: So, last night, you might have been thinking, “Heather, this storm isn’t all that. What’s the big deal?”. I admit, when I went to bed last night, I was thinking that maybe I’d really chickened out by hiring someone to come by with a snow blower this afternoon. I even woke up thinking that maybe I’d chickened out by hiring someone to come by at 4pm with a snow blower. Because I thought that multiple times. And then I came downstairs. By now I think you recognize the backyard. All I did was laugh. That’s all you can do, folks. The snow is over the slider door. That table is double what it was when I went to bed. And the snow is pouring right now. This is amazing! I can’t even imagine! And what was the next thought? OH YEAH YOU KNOW I’M GLAD I HIRED THOSE KIDS WITH A $&%*#@ SNOW BLOWER. It’s really difficult to get a picture out the front that shows you just how bad it is out there. I know how tall those trees are, but you guys don’t, so the small mountain under the tree probably doesn’t look like a lot when I can tell you that is a very tall pile of snow. Yesterday, while I was shoveling, the neighbor’s kid wanted me to put all the snow on their lawn so she could make a fort. I explained she was going to have more snow than she could handle by today. She’ll be thrilled, if she’s able to dig out of their front door this morning. I think it’s just blowing about in the front yard. It’s very difficult to see the snow, and only when I took pics from upstairs could I see where people had shoveled, and where new snow had fallen, etc. I can tell I’m starting to get a bit stupid – lack of sleep last night and a lot of physical exertion today; so I’m heading off to bed. More to come tomorrow, unless something odd occurs overnight. The current belief is that between 1am and 1pm US EST, this storm will be at its worst. So there should be some interesting pictures in the morning. 8:33pm US EST: I’ve been snuggled under a blanket with a cup of tea, a book and the internet. After deciding to switch over to my heated blanket, I got up to check on the snow progress. I can hear some folks outside scraping or shoveling. A huge plane just went overhead as well, which was a surprise considering the current conditions. I guess Dulles Airport is still operating. Front Door: It’s hard to see it due to the lighting and the glass door fogging, but it’s snowing quite heavily. Also, the snow is up to the front step again. I’m guessing that in a few hours, it will be difficult to open the storm door, but I am not planning to go out and shovel again tonight. The minimal snow next to the car tires makes it look like there’s little on the ground, but I think that much of the snow is drifting between yards. Backyard: This is a better representation of total accumulation, but again I suspect the wind is moving some of the snow around the backyard. The current temperature is 23F/-5C, but with 19mph winds, it’s supposed to feel about 7F right now. Winds are supposed to pick up again soon, sustaining around 25mph for the next 24 hours. Snow will continue overnight and into tomorrow, tapering off tomorrow night around 10pm US EST. 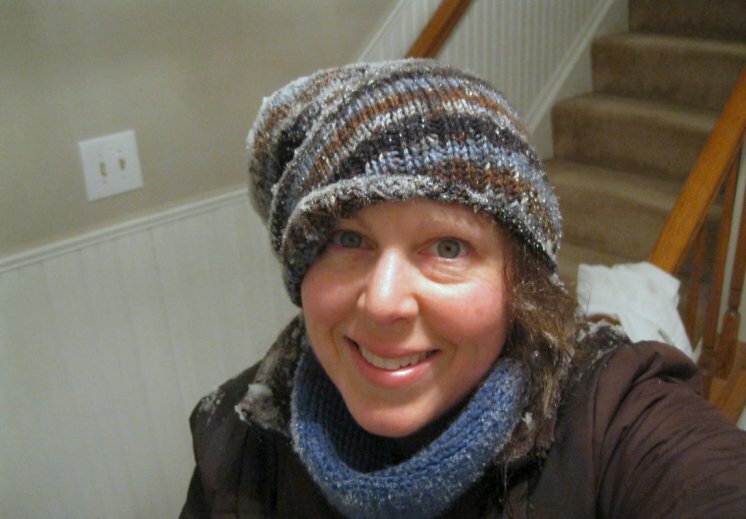 6pm US EST edition: I went out around 5pm or so to do the first round of shoveling and make sure I could get the front storm door open. The snow is a very fine powder and blows easily. You can’t really toss the snow into a pile, otherwise it just blows back at you. 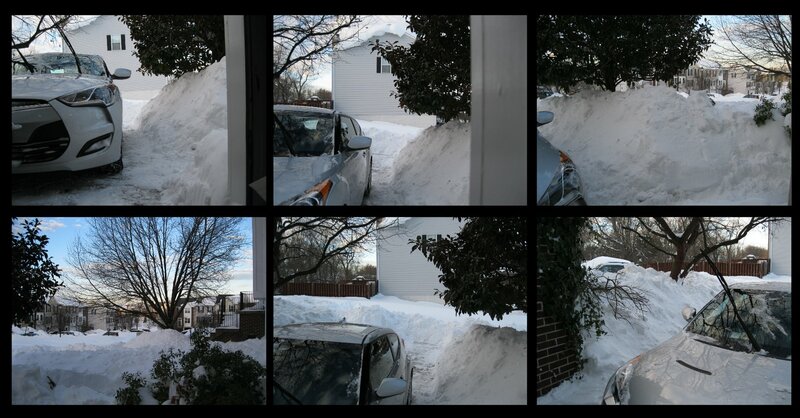 So I did a lot of shuffling piles of snow around the driveway, and then did the neighbor’s drive as well. And the walk to the mailbox, reshoveling what someone had done earlier. The snow is measuring around 4″ before shoveling, but it does drift higher or lower in some spots. 6:16pm US EST – first contractor snow plow has arrived! Not bad! 5:48pm US EST: Snow is up to 5″ or so (blows around a lot). More pictures coming soon. Sun just went down. 3:38pm US EST looking at the backyard. 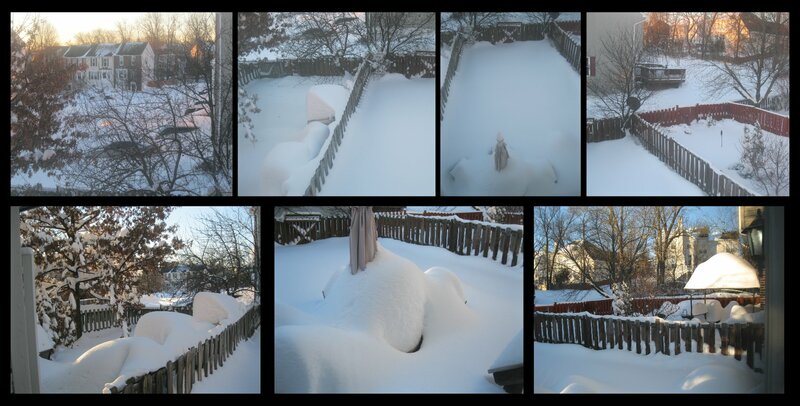 As I’ll need to start shoveling out front, the backyard view might remain the pristine view. 🙂 Also, in the next hour or so, we’re going to see a larger amount of snow coming down. And tonight we might get Thundersnow! I haven’t seen that in years and can’t wait! After 8pm US EST, the storm is really supposed to ramp up. 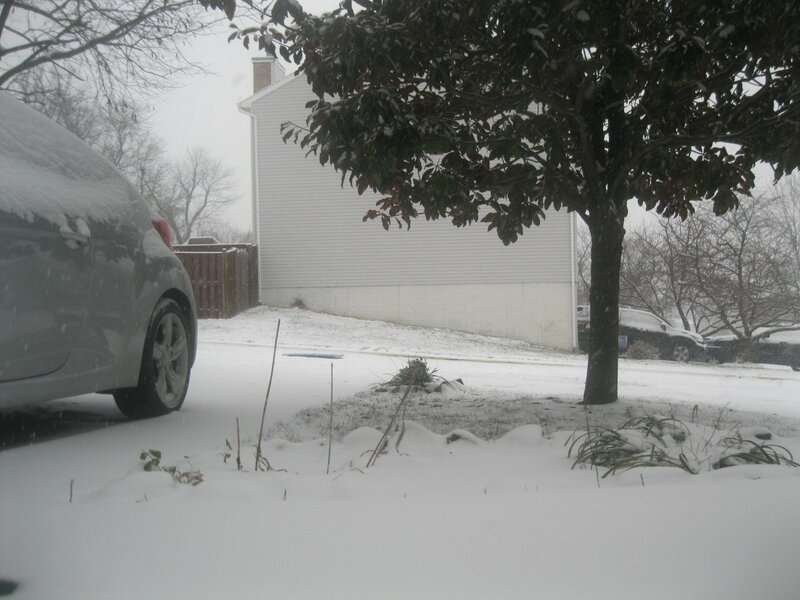 3:15pm US EST – There are kids sledding out front, as evidenced by the abandoned sled in road in the picture. Not looking all that dangerous yet, but tonight, we’ll be getting 2-3″ of snow per hour. 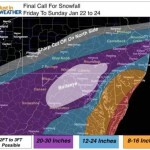 They are saying we will see snow until Sunday afternoon now, and 20-30″ is what we’re aiming for now. 1hr of yoga; 40 min on treadmill. Snow is continuing to fall and now looks like the below at 1:50pm US EST. This entry was posted in Weather on January 22, 2016 by GirlNovember.